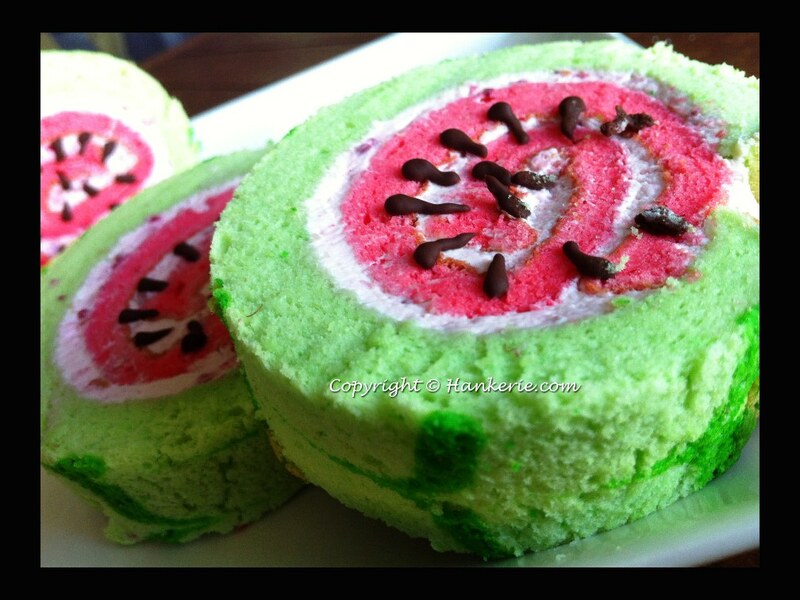 Watermelon as cake??? Have you seen this before? 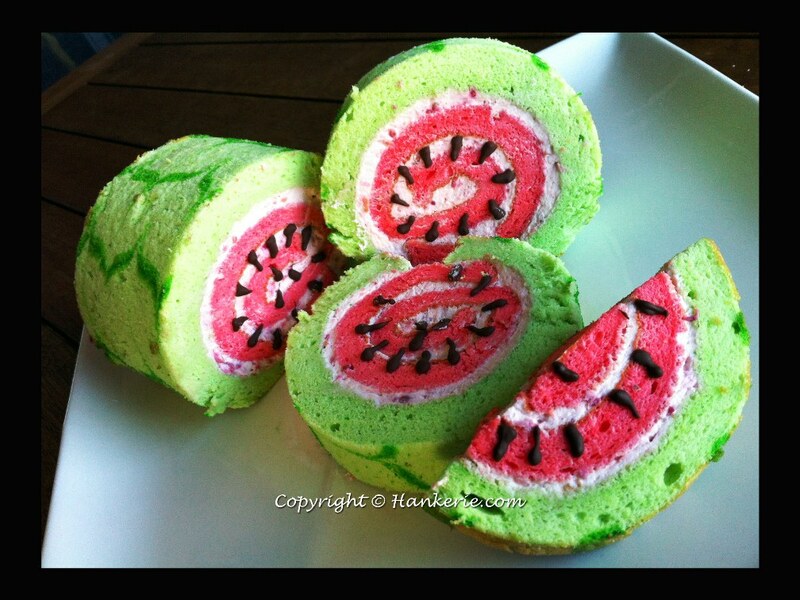 Yes, indeed they are just swiss roll cake but look like watermelon!! 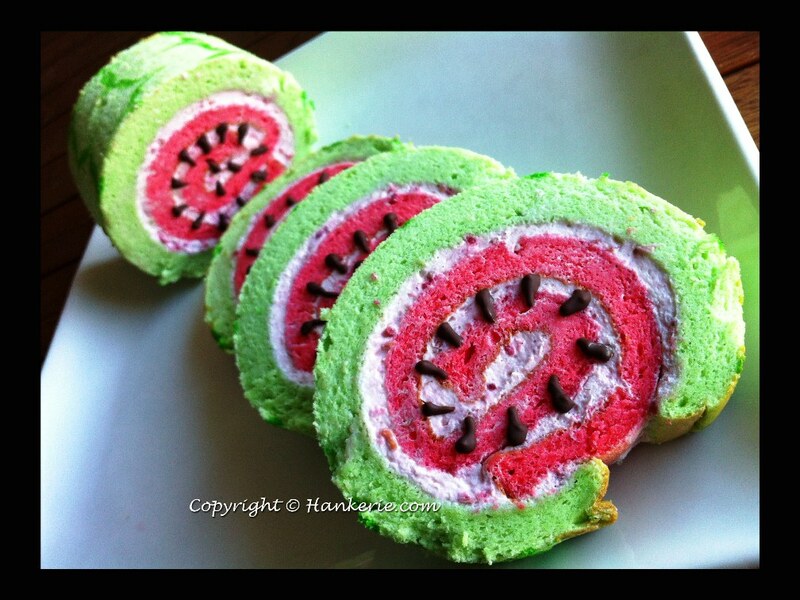 Hankerie came out of this idea - watermelon swiss roll. I will name it as "cakemelon". This creative idea inspired from the Australia Melon that I've seen in supermarket here. Most of the Australia watermelon melon are more pinkish, but suprisingly they're sweeter than what we have in Malaysia - red flesh watermelon. Well, I always like to bake special thing particularly those can be deceived by its look. 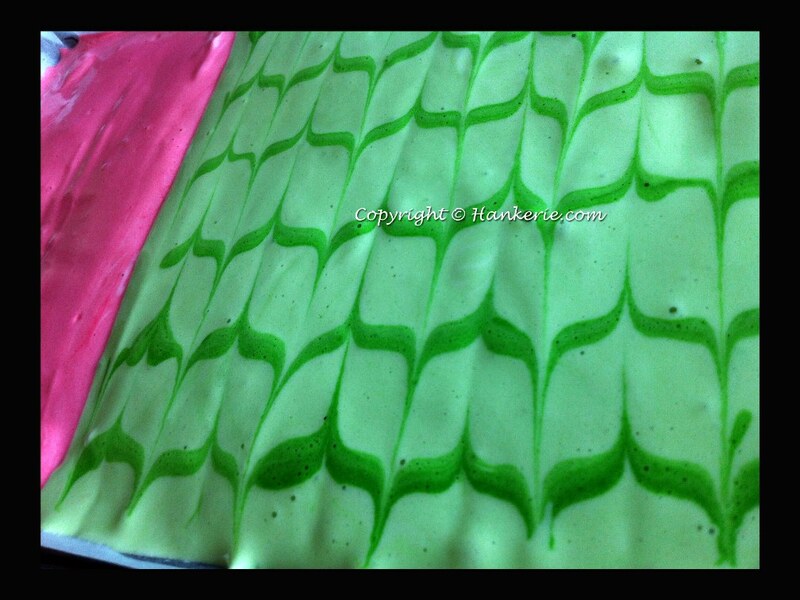 A cake looks like watermelon, your taste bud will get totally confused but what you see before consumption. For the 1st bite, you tend to think this is juicy and sweet, but in the same time, it gives you the cake flavour - fluffy, soft and different sweetness from watermelon. Cut into slices, take closer look of the seed! That's my favourite feature swiss roll thus far. Due to my limitation of my baking tray, I combined two colours batter together. It worked so well. For the watermelon skin part, I use my coffee latte art method again to draw the line. Preheat oven to 200ºC. Grease and line a Swiss roll tin. Put eggs and caster sugar into a large mixing bowl and whisk until light and creamy (it should be very thick at this stage). Sieve flour into mixture and fold very gently using a teaspoon. Add on oil and vanilla essence. Spread into 2 bowls with red and green food coloring respectively. Pour the mixture separately into tray carefully. Draw the green line on the green mixture to represent the watermelon skin. Bake for 10-12 minutes until golden brown and springy to touch. While cooking place a piece of greaseproof paper on a cooling tray and sprinkle with sugar. When the sponge is cooked remove from oven, tip upside down on sugared paper and carefully remove paper from sponge. Cut off any hard crusty edges. Spread with cream and roll. Leave in paper for a few minutes before serving on a plate. Looking for traditional swiss roll recipe? Refer to my previous post - Vanilla Swiss Roll. this cake looks so beautiful, you are creative. What a beautiful presentation this makes for a summer party... really festive and creative. this is really creative and beautiful! Such a creative and beautiful presentation! Plus I love the raspberry filling. I love visiting your blog as I find so many creative and yummy treats. I do some baking of my own but not professionally. Though it is my plan in the future to have a bakeshop of my own so I'm gonna take a few classes to learn. 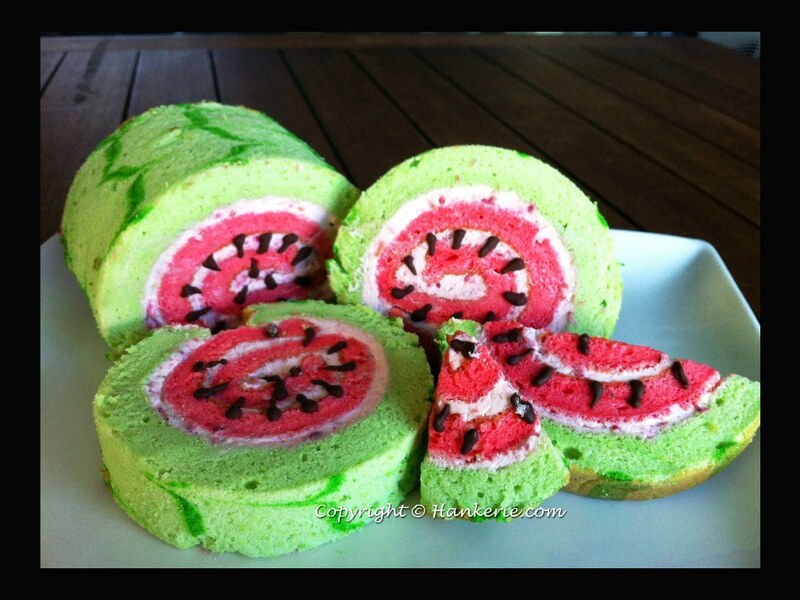 Wow you are so creative young lady.May I know the size of your tray for watermelon swiss roll.Thanks! What a brilliant idea! Love the cake! It is NOT burger! It's burger MACARONS!